Whether it’s rocking out to Rick Ross’ “Sanctified” or the Tamale Hip-Life legends R2bees, we know how to have a great time. We are currently working in the village of Changyili, which is only a short drive of 30 minutes out of Tamale. Along our way we are able to see the local vegetation and markets where the people are always happy to greet us. No hand wave is left unanswered! It should be noted that the chief of Changyili is the most relaxed and friendliest elderly man we have had the chance to meet in Ghana. As he chilled in his home-made recliner stroking his grizzly grey beard and smoking a personal rolled cigarette, he watched us paint our new metal stand that will hold the Polytank full of clean drinking water. 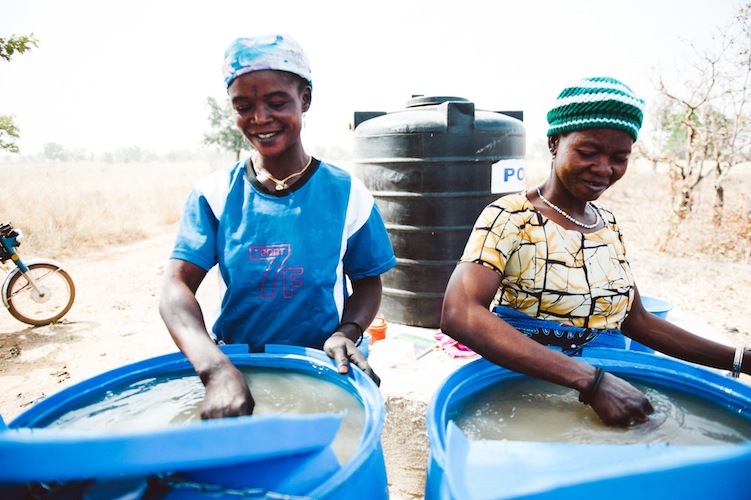 We began our work by setting up the water drums and Polytank, and once the women were selected we were eager to begin training with them. When we finish our work for the day, we usually play with kids in the village. The first game we ever played with them was the infamous “tag”. Thinking that because most of the kids involved were younger and smaller we all expected to easily stay out of reach of being “it”. Unfortunately, we quickly realized that either we had suddenly all become incredibly out-of-shape overnight or these kids were all solid contenders for Usain Bolt. We’re having a great time and the villagers are really appreciative of CWS, which gives us all great encouragement. They’re excited that this project is bringing health to their community, and we’re excited that we’re learning so much about their lifestyle. It’s neat when they teach us the language of Dagbani, let us do hands-on work with them to make their food, and show us games all the kids play. We get to pet baby goats and laugh with the people through simple means of communication and hand symbols. As a group we are really looking forward to opening day tomorrow. This will mark the start of the new water business for the women entrepreneurs we have trained for the past two weeks. In addition, this business will provide clean water for the village of Changyili! GO TEAM TEEJ!